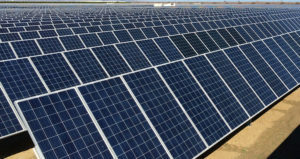 Central Iowa Power Cooperative (CIPCO) has announced plans to develop what would be the largest solar project in Iowa. CIPCO is partnering with Clenera of Boise, Idaho to develop the project. Jared McKee is Clenera’s director of business development. “It will be 100 megawatts AC. So that’s actually the amount of power that will be delivered to the transmission system. And it’s estimated to be roughly 200 megawatt hours annually,” McKee explains. The solar facility will be built on 800 acres of land in Louisa County near Wapello. McKee says they are still working on the details and won’t start putting up panels for at least the end of the coming year. He says construction is slated for the end of 2019 and the start of 2020. McKee says they are looking at the best types of solar panels to use at the facility. “We are contemplating several different styles. There is one that we have in mind that will be utilized in the project, there’s a couple different things that we can do,” according to McKee. He says whatever they choose will be the latest technology. This Wapello Solar project is in the area served by Eastern Iowa Light and Power cooperative. McKee says more solar is being built in Iowa as the costs continue to drop. “Technology is getting better, the efficiency is getting greater. We’re moving with our suppliers to have better technology and better processes to really drive down rates,” McKee says. This is the second major solar project announced by CIPCO and goes along with the 60-megawatt project to repower the Summit Lake Generating Station in Creston. The project includes demolition of its 70-year old steam plant and installation of efficient natural gas-fired reciprocating engines by late 2022. CIPCO says the increased use of solar power will help offset the nuclear power being lost by the closing of the Duane Arnold Energy Center (DAEC) in Palo in 2020. CIPCO is 20 percent owner of the nuclear plant and receives 20 percent of its generating capacity from that plant.